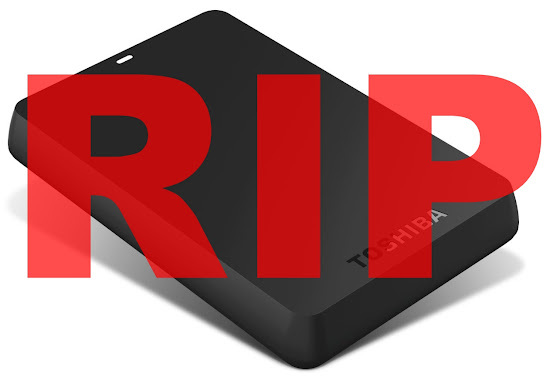 My external hard drive just died today and the culprit is my 2-year old Son. What happened was an accident. My little son pulled the antenna wire which in turn pulled out the external hard drive from its place on the TV rack. The virtual storage of our memories hit the tiled floor from a height of about 5 feet. It no longer worked ever since. Our external hard drive (EHD) contains my important files such as copies of my papers written during my college years, Word files of my blog posts, and our precious videos and photos dating back to my teenage years. I am somehow thankful that I backed up some of our precious photos to another EHD. The other files, however, are no longer recoverable. The EHD is just one of the many gadgets that my son destroyed. The truth is that he already destroyed two cellphones, broke the screen of my smart phone (I am still using it), threw My Beloved Wife’s phone to a bowl that is full of water (it was not damaged thankfully), and destroyed my Lumix camera. The recent incident with the EHD is a test of patience and letting go. I didn’t felt extreme anger when I discovered that the EHD no longer works. I reasoned out that there’s no point getting angry about it and punishing my 2-year old for this accident will result into more problems (i.e. psychological and emotional). I had to let go of the irrecoverable files stored in that EHD. It is sad that I will not be able to access those files but I can only move on. I learned many lessons after this incident with the EHD. One important lesson is the importance of backing up my files. Another lesson is to keep our expensive gadgets in secure places that are out of reach of our makukulit na babies. The last lesson is that my children are more important than mere things. That I should be more understanding, especially now they are still learning what is right or wrong. That I should be more patient with them and and should not place their emotional development in jeopardy. This a Daddy's Corner post! Daddy's Corner is where I post my thoughts on my life as a Daddy to two wonderful kids and Husband to a very loving wife, and my journey in raising a family. I guess she don't have the time to make a back-up of her files. Unfortunately, we realize that until it's too late. We all learn from painful mistakes. With little kids around, we have to be extra careful with things that are important. Most times it is not the little one's mistakes. Sometimes, accidents do happen. Exactly what i thought about! "I learned many lessons after this incident with the EHD. One important lesson is the importance of backing up my files. Another lesson is to keep our expensive gadgets in secure places that are out of reach of our makukulit na babies." hahaha. Given the internet here in the PH, sometimes it's just so lazy to onlne back up. Haha...yeah. Our ISPs are so bad and backing up files will surely eat up the expensive data allocation. Oh oh....you cannot use the "I-am-just-a-toddler" excuse. I am glad that you're OK na with your Bro.